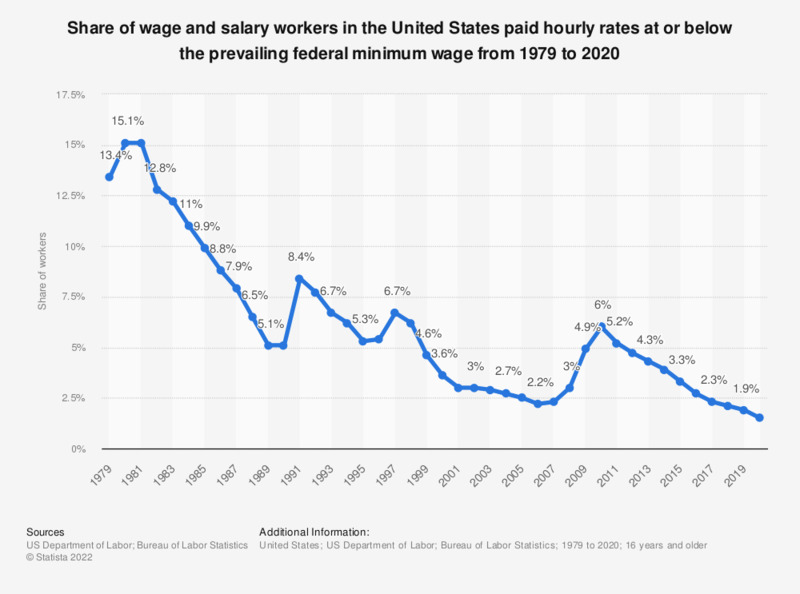 This statistic displays the share of wage and salary workers in the United States paid hourly rates at or below the prevailing Federal minimum wage from 1979 to 2017. In 2017, 2.3 percent of workers were paid hourly rates at the official minimum wage. The prevailing Federal minimum wage was $2.90 in 1979, $3.10 in 1980, and $3.35 in 1981–89. The minimum wage rose to $3.80 in April 1990, to $4.25 in April 1991, to $4.75 in October 1996, to $5.15 in September 1997, to $5.85 in July 2007, to $6.55 in July 2008, and to $7.25 in July 2009. Everything On "Average wage and salary in the U.S." in One Document: Edited and Divided into Handy Chapters. Including Detailed References. Do you think raising the minimum wage would reduce the number of jobs, increase the number of jobs, or have no impact on the number of jobs? Do you think the federal government should set a minimum wage, or not? Small-business owners: If a law is passed to increase the minimum wage, do you think this would help most small-business owners, hurt most small-business owners, or have little effect on most small-business owners? What if raising the minimum wage caused some employers to lay off workers or hire fewer workers? Would you favor or oppose raising the minimum wage? Do you view minimum wage jobs as stepping-stones to help lower skilled or younger workers gain skills, or as long-term positions for established workers to support their families? Small-business owners: would you approve or disapprove of a law that would raise the national minimum wage from 7.25 up to 9.50 U.S. dollars per hour? Suppose that on Election Day you could vote on key issues as well as candidates. Would you vote for or against a law that would raise the general minimum wage to 9 U.S. dollars an hour?